Until about 25 years ago I was in frequent contact with fellow tier Robert Pfandl who unfortunately died prematurely in 1989. It was then that I used, and sold, a couple of his spools of multifilament material. A little later a well known supplier carried a similar material under the name of "Bodythread". Both products were suited for producing flies, but one had the filaments too parallel for my liking, whereas the other one had them twisted too much. By lucky accident I found a material which corresponded 100% to what I sought in such a thread. I have been selling it for many years now. As I have recently expanded my color range from 20 to 34 different colors, I thought I might use a little more space to inform you about its versatility and give you a few examples of what you can do with it. 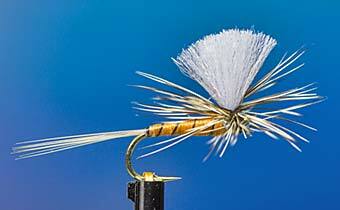 Tying Flies. Other than flies formed by simply gluing plastic onto a hook, there is hardly a pattern on which my body material could not be used. Be it dries, emergers, nymphs, wets, or streamers - you may use my body thread on any of these to form the body, but not just the body. You can just as well use it to form wings, wingcases,or tails. The simplest example is the Red Tag, where my body strand is used to make the tag on the dry as well as the nymph version. Currently I have 34 colors available - 30 "normal" ones and 4 UV- active colors. As you can easily mix all these versions, you can achieve just about any color a tier might wish to realize. I'm not excluding further add-ons for the future, though. Row 1: 01 chamois, 02 salmon, 03 light yellow, 04 yellow drake, 05 honey, 06 mango. - Row 2: 07 light red, 08 dark red, 09 fuchsia, 10 claret, 11 rose, 12 antique rose. Row 3: 13 sand, 14 powder, 15 rouge, 16 light brown, 17 medium brown, 18 dark brown. - Row 4: 19 reed, 20 olive, 21 caipirinha, 22 light green, 23 medium green, 24 dark green. Row 5: 25 light grey, 26 silver grey, 27 medium grey, 28 gunsmoke, 29 charcoal, 30 black. Please use the above 2-digit numbers to complete the item-numbers in your order. All spools come with 100 meters each. 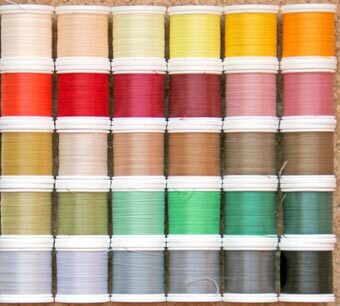 Just like I offer for string material, I can also fill your spools (for Norvise, Rite etc.). Strength only comes in second or third place of the qualities we search in a bodythread. What is important, is that the material disposes of a certain "spring" that makes it larger in diameter if it is without tension and smaller under tension. If you tie it in under tension, you can use it like normal thin twine as long as you remember its breaking strength is inferior to that of, say, Dyneema. Moreover, it should be easy to "split" into separate strands, so you can introduce dubbing or feathers between those strands. In order to use it on small patterns, it should not be too large in diameter. If you use it on larger patterns, you can easily get to larger diametersby doubling the strands you use. If you want to form the tag on a Red Tag, you can use the same material on a size 20 and a size 8. In the photograph above, the tag on the Orange Tag size 18 consists of 4 strands, the Red Tag`s size 8 tag consists of 32 strands. Of course, you're not expected to add strand by strand. If you cut off a yard and fold it double it makes two strands, fold it over again and you have 4 strands, once more makes 8. Fold it over 5 times and you reach 32 strands. The same goes if you use my material for wings. No matter if you're tying parachutes or split wings for hackled flies. The larger you want them, the more often you double it. In the parachute fly on the right both body and wing were built of my stuff. To increase contrast I used Dyneema colored by a black permanent marker as ribbing. The body's taper is formed by using more or less turns of body thread. You start where you want to place the wing, add about 2mm of wrap towards the hook bend, wrap back and add another 4 mm, return and add 6mm, and if there's enough room, add another 8 mm. You get a body that is thin towards the bend and gets thicker towards the eye. To form the parachute wing, we again double the material as many times as is needed to achieve the right volume for our hook size. With a little practice this will work out just fine.